Having made an effort to broaden the timeline context in which the Mughal Empire had its day, given a few examples of the Islamic influence in Vaisnava art over a long period of transition, we return now to the actual era of the Mughal Empire. Coming between Babur, the first invading emperor to overturn the Sultanate, and Akbar was Humayun, who ruled the empire from 1530 to 1556. While the history of pious Vedic kings and rulers were often recorded for posterity by scribes working under the approval of brahmanas, in the case of the Mughal rulers, much of their personal history was recorded by consorts from the royal harems, or other close family members. 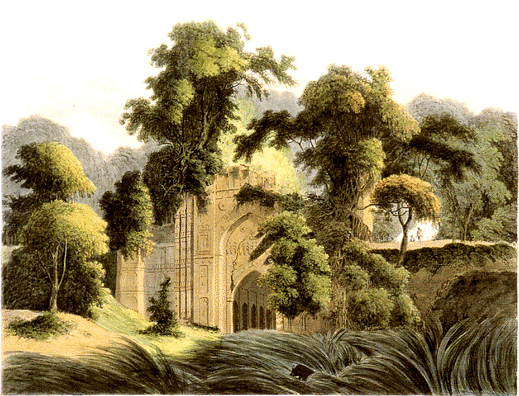 Humayun's history was preserved in a manuscript entitled Humayun-Nama, written by the princess Gul-Badan Begam. 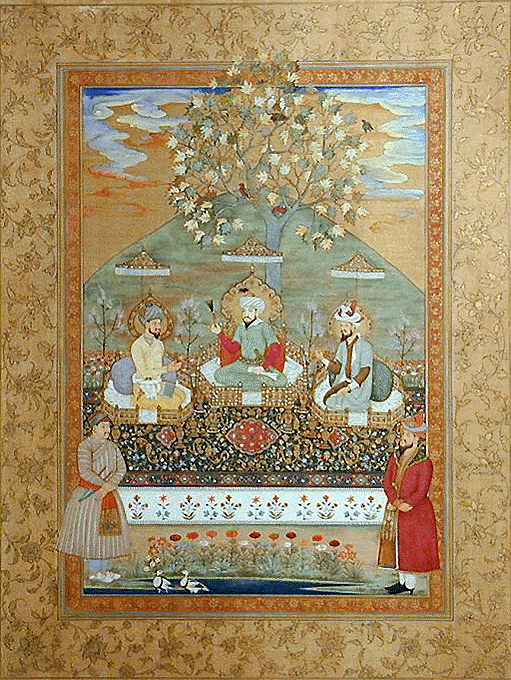 Gul-Badan observed the reign of three successive Mughal emperors – her father Babur (Firdaus-Makani), her brother Humayun (Jannat-ashyani), and her nephew Akbar. 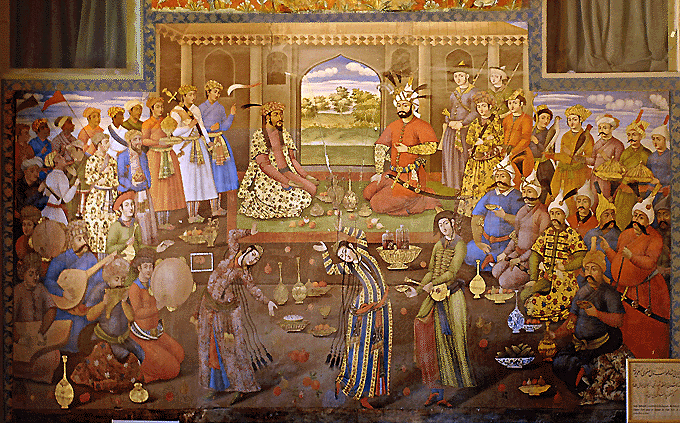 Her reminiscences of Humayun were rounded out with anecdotes provided by others in the court harem. Having a tendency towards laziness, Humayun lost the kingdom that his father Babur had established in India. Humayun and his family fled to Lahore, then later to Kabul, and he remained in exile for the next fifteen years in Afghanistan and Persia. Shortly after being exiled, Humayun became enticed by a 13-year old girl, who he married, giving birth two years later to a son, named Akbar. In 1556, just a year after returning to power in India, Humayun died by falling down a flight of steps at the Purana Qila, a pavilion in Delhi. During his exile, Humayun made the acquaintance of two highly talented artists, Mir Sayyid Ali Tabrizi and Khwaja Abdu's-Samad Shirazi, who returned with him when he again returned to power in India. These artists, renowned for their portraiture work, are often considered to have been the fathers of the Mughal School of miniature painting in India. While in Humayun's court in India, these artists, Samad Shirazi and Ali Tabrizi, trained and inspired many local artists, and their influence has been carried over the years, evident in many later Vaisnava paintings. Under their guardianship, two of the most famous painters in Akbar's court were trained -- Dashwant and Basawan. At the time, about 75 percent of Humayun and Akber's court painters were Hindus. Having first taken power in India about four year's before the departure of Lord Caitanya Mahaprabhu, Humayun's entire rule was over just 14 years after the Lord's disappearance. During this time, the history of the early Mughal rulers intersected in some interesting ways with Mahaprabhu's Gaudadesa. Around this time, the man who would unseat Humayun from his throne was getting ready to assert his independence under the Emperor. In 1531, Sher Khan began to make other local rulers very worried about his quick rise to prominence. Both the Lohani Afghans and Jalal Khan were in anxiety about Sher Khan – so much so that they entered into an alliance with the King of Bengal, Muhamud Shah. But in 1534, Sher Khan defeated the Bengal king on the Kiul River, invading Bengal taking a large sum of money from Muhamud Shah's treasury, and a great deal of his land. Sher Khan thus became the independent ruler of Bihar and Bengal. In 1537 he increased his threat against Bengal, laying siege to the city of Gaur. By this time Humayun realized the great strength of his Afghan challenger, and prepared to march against him. Humayun Attacked Chunar, but failing to rout Sher Khan out of Bengal, by April 1538 the Khan was firmly established in the area. While Humayun was busy marching towards Bengal, Sher Khan outwitted him by occupying the Mughal territories in Bihar and Jaunpur. Finally, in 1539, Sher Khan defeated Humayun in battle at Chausa, near the boundary of Bihar and Uttar Pradesh. The next year he defeated Humayun at Kanauj, then captured Delhi and Agra. Sher Khan subjugated the citizens of Bengal, Malwa, Sindh and Multan, opposed only by the Rajputs of Marwar. He ruled the area from Bengal, west to the River Indus until his death in an accidental gunpowder explosion. Although he ruled for only five years, Sher Khan left a significant mark on the administration of government. His influence is still found in India's Constitution, in its tax system, and in the structure of its provincial government. Neither Humayun nor Sher Khan had much interest in religious matters, and beyond the construction of a number of Islamic monuments, they had relatively little impact on the devotional arts or literature. The greatest influence was that of Humayun's painters, whose expertise in miniatures can be seen in many later Vaisnava canvases. And this we will explore in greater depth later in the series.